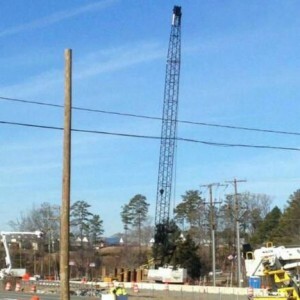 The boom of a lattice crawler crane threatened to come down today across a major road and power lines in Chesterfield Virginia. The crane a Terex crawler owned by Corman Construction was working on a road project when the boom started to go over the back. Fortunately it didn’t and worked on the site used web slings to try and anchor the boom in order to prevent the crane losing stability and overturning. An All Terrain was then called in to try and help lower the boom. The utility company cut the power lines, while the police closed the road. As far as we know the recovery is ongoing. We are not quite sure what caused the boom to get into this condition. Although early indications are either a recoil effect from an unplanned load release or overluffing.